Ricardo Santos celebrates after scoring the winning goal for Posh at Doncaster. Photo: Joe Dent/theposh.com. To some he’s heading for Benfica. To others he’ll be lucky to reach Bolton Wanderers, but few should deny or decry Ricardo Santos his moment in the sun. The worth of Santos splits opinion among Peterborough United folk and the reasons why were evident during a poor quality game which nonetheless delivered a quite dramatic finish, one that sparked wild scenes in the away seats occupied by over 1,400 supporters. Ricardo Santos slides in front of the Posh fans at Doncaster after his match-winning goal. Photo: Joe Dent/theposh.com. In the fifth minute a clumsy attempt by the 20-year-old defender to shield the ball as it dribbled over the goal-line failed miserably enabling Doncaster to take the lead. 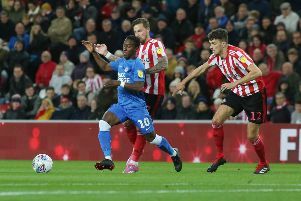 In the 93rd minute a swing of a long left leg by the Portuguese player sent the ball speeding into the net to seal a first victory in eight League One matches for Posh and put an end, for now at least, of increasing talk of an unwanted relegation battle. The celebrations in front of the Posh support were mightily impressive. It was sheer joy, no doubt mixed in with sheer relief, as Santos displayed his rippling physique before he was flattened by team-mates who had forgotten how to smile for most of 2016. They were perhaps fortunate to be meeting a team whose form was even worse - these two sides had played 18 matches between them without winning. Doncaster, under former Posh boss Darren Ferguson, have not won now for 12 matches and this defeat would have hurt. It would be over-stating it to say the home side were mugged after a dominant second-half display, but they certainly had their pockets picked by a Posh side who spent most of that time on the back foot until remembering getting the ball to Marcus Maddison is probably the best way to create a goal. Maddison supplied the right-wing crosses for both goals. Fergie was remiss to let the best Posh attacker have so much freedom in the first-half and he duly supplied the pass for Aaron Williams to tap in at the far post for an equaliser just before the break. The Posh players pile on Ricard Santos after the defender's last-gasp goal. Photo: Joe Dent/theposh.com. Posh deserved to be level at that point, but the Santos strike after Williams had done well to head a deep, hanging Maddison cross onto the post, was far more of a surprise. It led to Ferguson claiming Posh were lucky and moaning that Santos should have conceded two penalties for holding at set-pieces - he was probably right on all counts, although his side’s failure to turn possession into goals after the break was equally damning. Doncaster found it almost impossible to get past the immense Michael Bostwick and when they did Andy Williams headed badly wide before Cameron Stewart and Nathan Tyson saw good chances thwarted by Posh goalkeeper Ben Alnwick. Tyosn had out-stripped Bostwick and raced clear on goal, but Alnwick, who endured some fumbling moments when trying to catch crosses, stood firm. It had all started so well for Fergie’s strugglers as Williams robbed Santos before feeding James Coppinger for a simple early strike. One could sense the anti-Graham Westley brigade sharpening their knives, ready to lambast the boss for his muddled selections, poor use of substitutions and his general failure to find a way to stop the rot. But Westley had a far better day at the Keepmoat Stadium. Okay making five changes to his starting line-up 48 hours after insisting he would be more stable with his selections was disconcerting as was playing 6ft 5in Santos at right-back while switching his regular right back, Michael Smith, to left-back. But playing Maddison in an advanced position wide on the right in support of the impressive Williams worked well and his substitutions were logical and effective, most notably after hauling Gaby Zakuani off seconds after the DR Congo international had followed a ‘clothes line’ wrestling manoeuvre with an immediate second foul that prompted referee Sebastian Stockbridge to issue a stern warning to skipper-for-today Bostwick. Westley should still tone down the rhetoric after the match as declaring Santos can ‘go all the way in the game’ won’t do the youngster any favours, but the manager was probably just revelling in the opportunity to enjoy a post-match press conference ror a change. Posh, despite their desperate form and results, stuck with their passing game which as usual involved some hairy moments with the ball at Alnwick’s feet, and they responded well enough to falling behind so early. Harry Beautyman, whose energy and attitude were impressive throughout, and Zakuani missed decent headed chances in the opening quarter of the game, while Bostwick saw a fierce shot charged down by a brave defender following a corner. But Posh faded badly after the break and relied on some stout defending to stay on level terms. They improved in the final 10 minutes when Williams inexplicably shot from 25 yards rather than run unopposed towards the Doncaster penalty area. But Posh, thanks to unlikely hero Santos, were not to be denied for too much longer. It was a first professional goal in 64 appearances for the match-winner. He doesn’t even score in training according to his manager. Remarkably Posh are now closer to te top six (10 points) than they are to the bottom four (11 points). Posh: Ben Alnwick, Ricardo Santos, Michael Smith, Gaby Zakuani (sub Andrew Fox, 60 mins), Michael Bostwick, Chris Forrester, Harry Beautyman, Jon Taylor (sub Shaquile Coulthirst, 64 mins), Erhun Oztumer (sub Martin Samuelsen, 71 mins), Marcus Maddison, Aaron Williams. Unused substitutes: Tom Nichols, Simon Gillett, Lee Angol, Mark Tyler. Doncaster: Thorsten Stuckman, Craig Alcock, Aaron Taylor-Sinclair, Andy Butler, Cedric Evina, Harry Middleton (sub Tommy Rowe, 46 mins), Luke McCullough, Cameron Stewart (sub Riccardo Calder. 90 mins), James Coppinger (sub, Nathan Tyson. Andy Williams. Unused substitutes: Louis Jones, Gary Mackenzie, Richard Chaplow, Paul Keegan, Liam Mandeville. Goals: Posh - Williams (44 mins), Santos (90 + 3 mins). Doncaster - Coppinger (5 mins). Doncaster - Williams (unsportsmanlike conduct).